Sony rumoured to launch OLED TVs at CES 2017 in January | What Hi-Fi? Rumours are swirling regarding the Japanese electronic giant's plans for CES. At the moment, only LG, Loewe and Panasonic sell OLED TVs in the UK, but they could soon be joined by Sony. According to Korean business publication ETNews, Sony will enter the OLED market next month. And it will do so with a little help from one of its arch rivals. The report says Sony's sets will use OLED panels from LG Display. LG Electronics (a separate company, but one still under the LG umbrella) is reportedly "disappointed" that the South Korean company would supply its Japanese rival. Sony's OLED TVs will sell to the "higher premium market" according to the report. No surprise there - OLED is still a relatively new technology, so OLED TVs cost much more than less advanced rivals. Forbes claims it has more details on the sets. According to Barry Young, CEO of the OLED Association, the sets will come in 55in and 65in versions, with panel shipments starting from the second quarter of 2017 (around April). That would miss the CES 2017 show, however, which is where ETNews has predicted Sony will launch the new range. 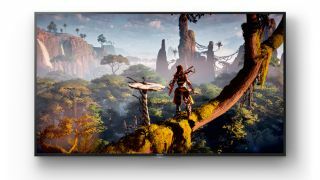 Young also claims that Sony anticipates it will ship 80,000 55in 4K OLED TVs, and 120,000 65in set - though he gives no timescale for these figures. And the price? Young estimates we'll pay $1999 (£1572) for the 55in, and $2999 (£2358) for its bigger brother. All this is just hearsay for now, of course - but we'll bring you the official details as soon as we have them. Sony told What Hi-Fi? : "We don't comment on rumour or speculation."